Everyone ages differently. Some individuals manage to maintain their youthful good looks with minimal skin looseness, droopiness and sagging well into their 50s, while others are not so lucky. Dr. Michael Bublik, a double board certified physician in Facial Plastic Surgery and Ear, Nose, Throat Surgery, explains that facial aging is a multifactorial, 3D process with anatomic, biochemical, and genetic variables. Exposure to the sun, alcohol use, smoking, body mass index, medications, use of drugs, and other elements, contribute to facial aging changes. Dr. Bublik clarifies that most of the aging changes occur in the midface, usually beginning in the mid-40s. Dr. Bublik’s patients first come to see him with concerns about under-eye bags and wrinkles, as well as smile lines - also known as nasolabial folds. These are the lines and creases that run from the side of the nose to the corner of the mouth, and are the result of normal loss of facial volume and skin elasticity as people age. The lines that run straight downwards from the corners of the mouth (marionette lines), are another sign of aging that frustrate many patients, as those lines can make them look unhappy. Marionette lines form as facial volume begins to lessen and deeper creases begin to form below the mouth. 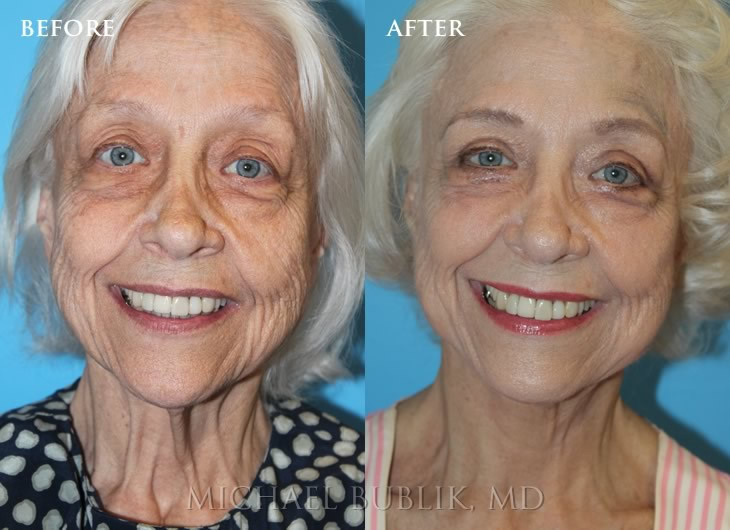 A significant number of Dr. Bublik’s patients visit him regularly for injectable fillers and Botox (or similar products), with excellent results in reducing and smoothing away frown-lines and wrinkles, plumping up nasolabial folds and marionette lines, resulting in a rejuvenated and rested appearance. Nonetheless, face-lifts are still a popular option for many of his patients. In fact, while many would think that non-surgical options would eliminate patients’ interest in face-lifts, the American Society of Plastic Surgeons has reported an increase in the number of face-lifts in the past few years. As surgical techniques have become significantly more refined in the past decade, and the results more natural, even patients in their 40s, women and men are choosing to undergo a face-lift. Today’s face-lifts are nothing like the overly aggressive (and at times “plastic” or “wind-swept” appearing look) face-lifts of the past. Particularly popular is the mini face-lift that lifts the mid-face and the only evidence it leaves is a 0.4-inch scar tucked into the crease where the ear joins the cheek. 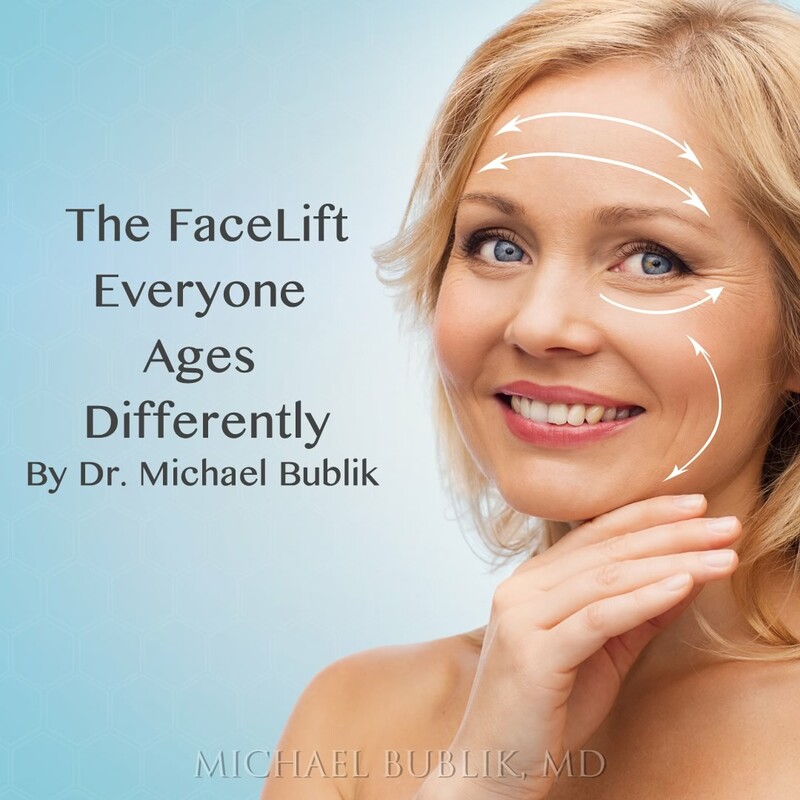 Dr. Bublik believes the best outcome of face-lifts occur when the patient still has good skin elasticity, which would make patients in their 40s and 50s ideal candidates for this type of surgery. Many patients mention the need to compete with younger professionals in the workplace, while others are ready to reenter the dating scene after years of being alone working 70-hour weeks, or after a difficult divorce or death of a partner. When asked what to anticipate after surgery, Dr. Bublik tells his patients to expect some discomfort, bruising and swelling, and makes it clear that most of his patients will need a full week of recovery at home. Most feel well enough to return to work or social activities by the end of the first or second week, when most of the swelling is gone, even if a little make-up is needed to cover some of the fading redness. However, the doctor makes it clear that while patients may feel well enough to return to normal activities, patients should stay away from certain sports such as racquetball, boxing and other undertakings that may compromise the face. Isn’t it time for you to reward yourself with a face that matches your healthy and active lifestyle? Schedule a free consultation with Dr. Bublik to hear about your options and learn how a face-lift can make you look as good as you feel.